Cooper Lighting Metalux™ HBL Collection High-bay industrial open luminaire in white enamel finish, features die-formed steel construction. It has six 54-Watt T5HO lamps. This lamp has voltage rating of 120 - 277-Volts. 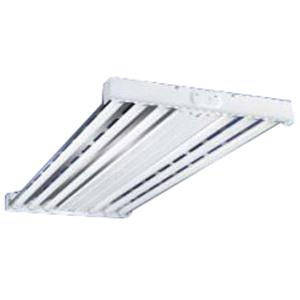 Rectangular luminaire with T5 linear electronic program rapid start 346-Watt driver, is suspension mountable. It measures 48-7/16-Inch x 19-17/32-Inch x 2-15/32-Inch. This luminaire in segmented optical design, enhances the performance by three distributions. It has F-bay modular power supply for quick power disconnect. It withstands temperature rating of 40 deg C. It is suitable for use in retail, shopping malls, light industrial and recreational environments. Luminaire is UL/cUL listed.